If you are here, you are looking for the highest quality glass that can get you out to the farthest possible range. Something that has big magnification and amazing optical clarity. We aren’t going to settle for second best! After scouring the market, and of the scopes we selected will be the best spotting scope under 1000 bucks you can find! Sure, you can go for the higher cost scopes but the truth is, you don’t get much of an advantage when using them over the scopes we have here. All of the factors that are going to affect how you use the scope will be so close that you will never know the difference. The glass may be a little clearer but the difference is so small you would probably never notice. Whether you are looking for spotting scopes for hunting, distance shooting, or a more relaxing endeavor, the scopes below will get the job done and done better than 90% of the scopes on the market today. A spotting scope is the sum of its parts and no part can be ignored if you want to produce a scope that is high quality. If you compromise on just one piece of a spotting scope, the image quality will be reduced, no matter how good the rest of the components are. All of the companies we have selected have a reputation for quality above all else. The products they produce rate highly in clarity, function, features, and durability. Whether you want a simple spotting scope for digiscoping or you are looking for more of a tactical spotting scope, any of these should excel. You have chosen a scope at this range because you aren’t willing to compromise when it comes to your gear. Taking the time to consider your options has led you to the place where you will get the most affordable spotting scope that will do what you need it to do. This is no cheap crap, only the best. When you get to this level of quality, most of the products are going to be comparable with most of the same features only separated by the smallest margin of materials and craftsmanship. That doesn’t mean you shouldn’t do your best to understand exactly what you are buying. Understanding these points will make you a more educated consumer. Most of the scopes in this price range will be variable and have a max power between 45 and 60 with the majority as 60 power scopes. The second number in the examples above represents the size of the objective lens. The larger the lens the brighter the scope's image will be. Opting for a larger objective lens will make the scope more useful in low light conditions. A large objective lens will also have a larger field of view allowing you to see a broader image. The four types of coating in are: Coated, Fully Coated, Multi-Coated, Fully Multi-Coated. While these go up in price from the first to last, they also go up significantly in quality. Nearly every scope in the $1000 price range will have fully multi-coated lenses. There are two styles of bodies available on a spotting scope that specifically deals with the orientation of the eyepiece. The type you choose will determine how easy the scope is to use for different purposes. A straight scope is great for a handheld option but using one from a shooting bench can be more difficult but not as difficult as using an angled scope as a handheld option. Either way could cause neck or eye strain. Most of the scopes at this price point will have sufficient eye relief to use however you would like with the norm being around 20mm. Paying a grand for a spotting scope is quite an investment. While these scopes really are worth the money, protecting your investment become very important. That’s why most scopes have some sort of coating to partially weather-proof them while also protecting them from any rough treatment they may get in the field. Most scopes will also be nitrogen or argon purged which will keep the inside of the scope from fogging during use. This is a vital feature to have on a scope. An inside lens fogging will put your scope out of commission until it has cleared. Expect the scopes here to all have full weather and fog protection. They are built durable and will last multiple lifetimes if properly cared for. If you have followed optics for a while, seeing Bushnell and Legend in the same phrase may seem a bit contradictory but believe me, this isn’t your daddy’s Bushnell. While they were better known for their budget optics back in the 1990s, they have really turned things around and the Bushnell Legend is one of the hallmarks of that change. With their proprietary ED Prime glass and a huge 80mm objective lens, this scope is super bright. Add 60x magnification to that and it’s powerful enough to do just about anything. If you are looking for a true 2000 yard spotting scope, this is it! All of the glass is multi-coated with extra-low dispersion to keep colors vibrant and images crisp with no fading or blurring around the edges. If you are looking to sight in a rifle or just a good spotting scope for target shooting, Bushnell has everything you need to get it done. Add in weatherproof lenses and full body rubberized armor to create a truly rugged scope that is weather tight and fully waterproof and anti-fog. I would never have thought it of Bushnell 10 years ago but they have really come out with an outstanding scope that will last a lifetime or more. Vortex is a newcomer on the optics market but they have been making some serious waves! The main strength of Vortex as a company is their ability to offer optics at a quality that is far beyond their price. This may be a pricey scope to some but to get features like this from another brand would cost you far more. The specially blended glass offered by Vortex on their Viper series of scope has been formulated to optimize color transmission and image clarity. Add in their own brand of multi-coating that actually increases color and brightness and you have one of the clearest scopes in this price range. Couple that with a massive 85mm objective lens and you have everything you need to spot a deer even in the lowest light. Like most optics in this price range, it is a 60x magnification scope at its max setting which gets you up close to your target but it’s the glass that really makes that magnification work. For the price, the image in the Vortex scope compares with even the higher dollar brands. This may very well be the best spotting scope for the money on the market. On top of all of that, you get their proprietary ArmorTek coating to resist scratches and dings, full argon purging to avoid any issues with fog, and a full body waterproof shell. The value of this scope can’t be underestimated, it is one of the best on the market today. Of course, a spotting scope doesn’t have to look tactical to do the job. Sometimes all you want is a spotting scope for ocean viewing, birding, or other calmer hobbies. That isn’t to say that that scope shouldn’t also be at home in the field and be rugged enough to handle the harsh elements a hunter is exposed to. Athlon has made just such a scope. Much like our other variable power 60x scopes, the Ares has fully multi-coated glass and an extra-large 80mm objective lens that will provide you unparalleled view, especially for the low cost of this unit. Ares hasn’t pulled any punches with this scope. It is ultra-bright, crisp, and has great color without washout. Something most budget scopes can never claim. Like their competition, the Ares has a rubberized armor to prevent damage and lock out water. It is nitrogen purged to prevent fogging and lens discoloration and can handle the very worst the elements can throw at it without giving in. Though it is capable of seeing farther, this is a great spotting scope for 1000 yards or so. It has enough zoom to pull in tight or get out there in the field for some target shooting. 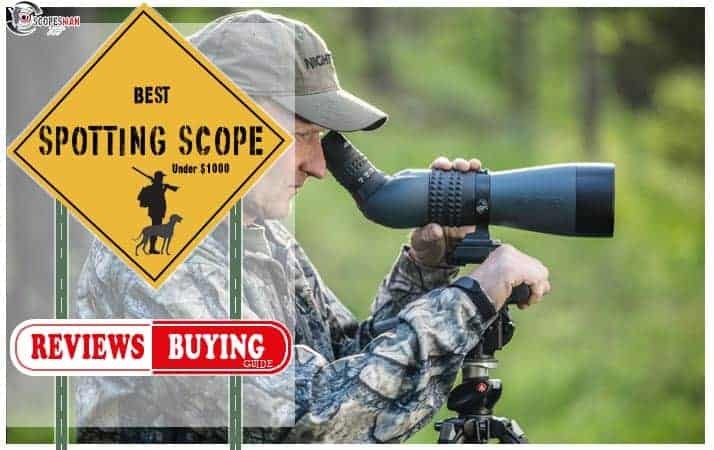 Considering the price, this may be a spotting scope for hunting that is hard to beat all the while blending into whatever other hobbies you may want to engage in. There are a lot of spotting scopes on the market. While those above are not the best in the world, they are the best for under a grand. If you want better, expect to shell out at least another $800.00. When you get into the upper echelon of scopes, each dollar buys you less and less quality so when it comes to getting the most for your dollar, this is the price range to look.